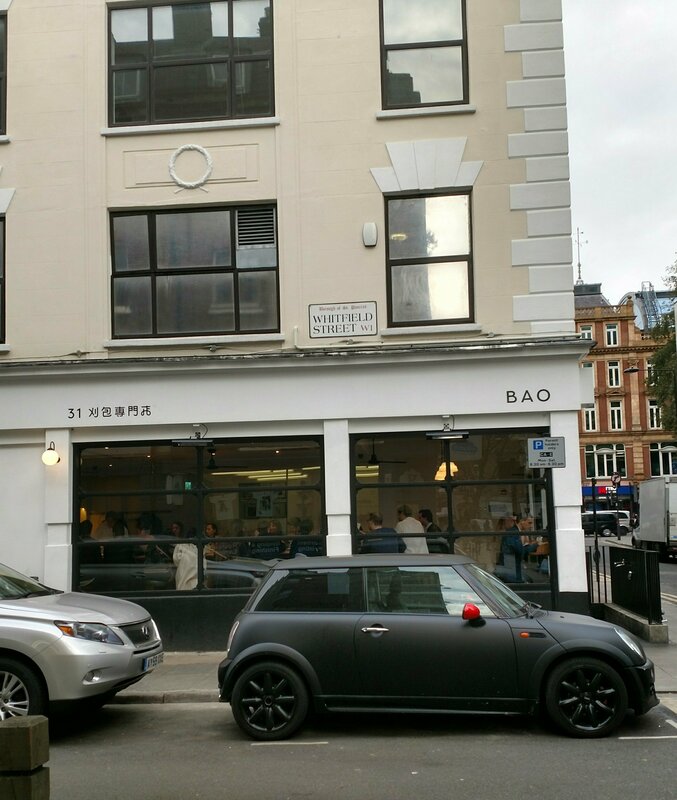 Bao in London has been somewhat of a phenomenon for a few years now, with tales of epic queues to grab one of the few tables/stools in their miniscule Soho restaurant (opened after roaring success as a food truck). As always I am somewhat late to the show in term of visiting the place. This is mainly due to the fact that my visits to London have (in many ways thankfully) been somewhat limited over the last couple of years, but also to the fact that I loath queuing and with no bookings taken at Bao’s original Soho restaurant queuing for a table is pretty much inevitable (some would say – masochists to my mind – that it is part of the experience). A trip up to London to a rather lovely UK Wine Hour live event gave me the opportunity to work out of our London office in the morning and then to have a spot of lunch before moving on to the wine event. 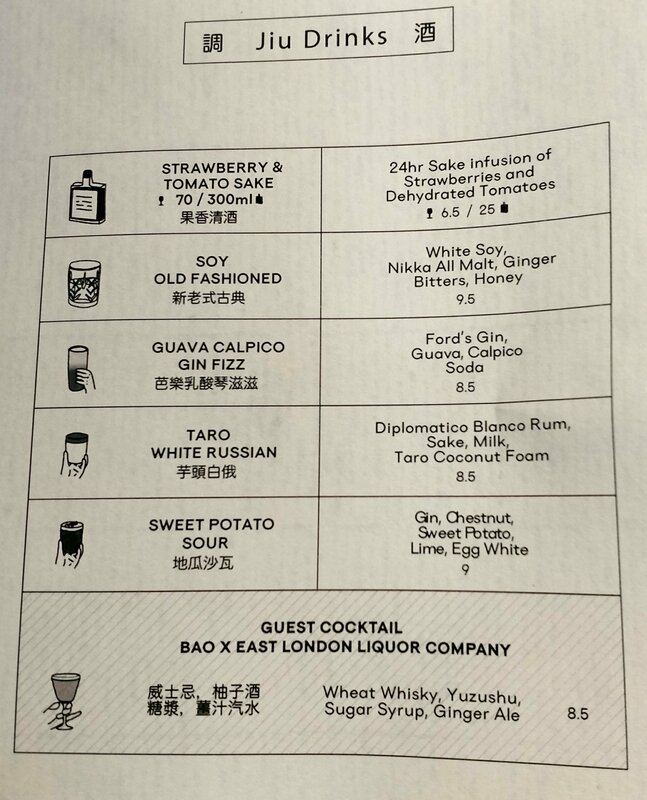 The queuing issue regarding the original Soho Bao was solved by the fact that their second restaurant in Fitzrovia takes bookings. Inside it is quite minimalist – tightly packed (imbedded into the floor) stools surround the oval bar area where some rather interesting cocktails and mocktails are mixed. Not a place to go on a date, perhaps, but perfect for a solo diner like me. and the size of the Xaio Chi (small plates – actually not that small) and Da Chi (more main course size) dishes. I said I was quite hungry and was directed to what looked like a very good value set lunch menu. The couple sitting next to me had this and it was a good size. Great for £15. 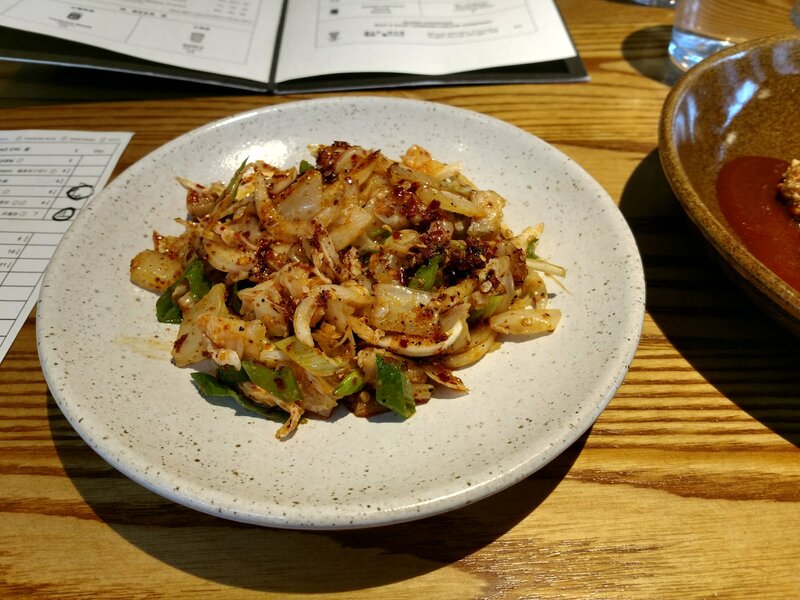 I had, however, taken a shine to one of the Xiao Chi dishes in the form of the smoked eel and golden kimchi (I adore smoked eel, ordering it instinctively whenever I see it on a menu, and as I love kimchi together I though this dish would be right up my street). I, therefore, decided to choose from the standard menu. 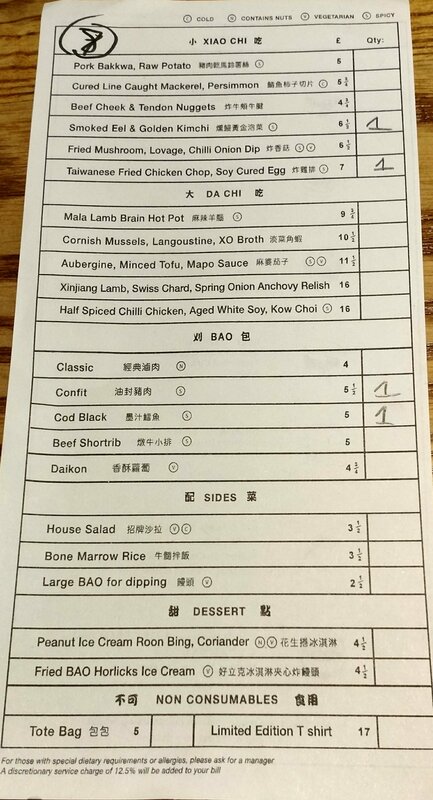 The food comes in waves rather than individually (bit like you get with tapas), with the two Xiao Chi dishes coming first. The smoked eel and kimchi was all I had hoped it would be, with the fiery, crunchy, flavour packed kimchi acting as a perfect counterpoint to the oily, rich, almost meaty smoked eel. Great combination of both textures and flavours. Eel is never cheap so I though £6.50 a fair price for it. Delivered at the same time was the best chicken dish (certainly fried) to have passed my lips for a very, very long time (perhaps ever). 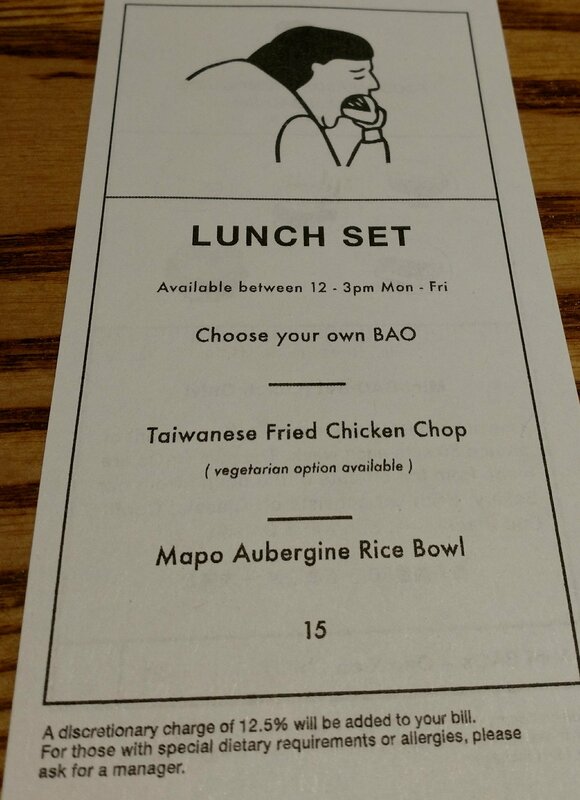 The USA and Korea have strong claims to have the best fried chicken in the world, but dear Lord the one on offer at Bao was nothing short of sensational and puts Taiwan right at the top of my fried chicken league. 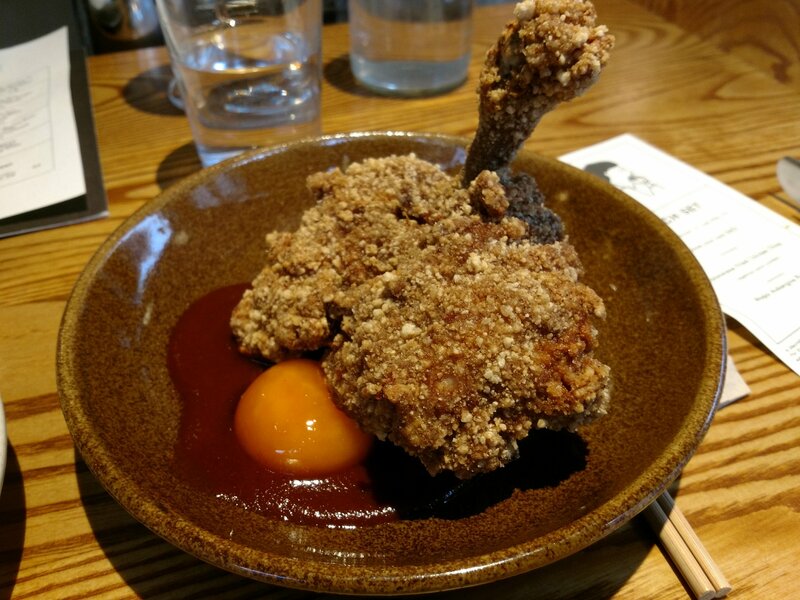 The coating was crisp and crunchy with a beautiful balance of spicing (a touch of heat there to) and no hint of sogginess that blights so many fried chicken dishes. I gnawed every last speck of it off the bone as I wasn’t wasting any of this precious stuff. Inside this amazing coating, was a lovely, juicy and succulent piece of chicken (from a very superior bird). Add to this a really good spicy sauce and a runny soy cured egg yolk (which you break up and mix into the sauce) and you have a chicken dish of the highest order. Absolutely stunning stuff and brilliant value for the £7 price tag. Next up were the place’s namesake, with the piggy that I am going for two of these. Baos are steamed buns made from wheat flour and a tang zhong starter. Light and fluffy pillows of loveliness are the result and they make a fab vehicle for all manner of fillings. Here they are a slider sort of size. 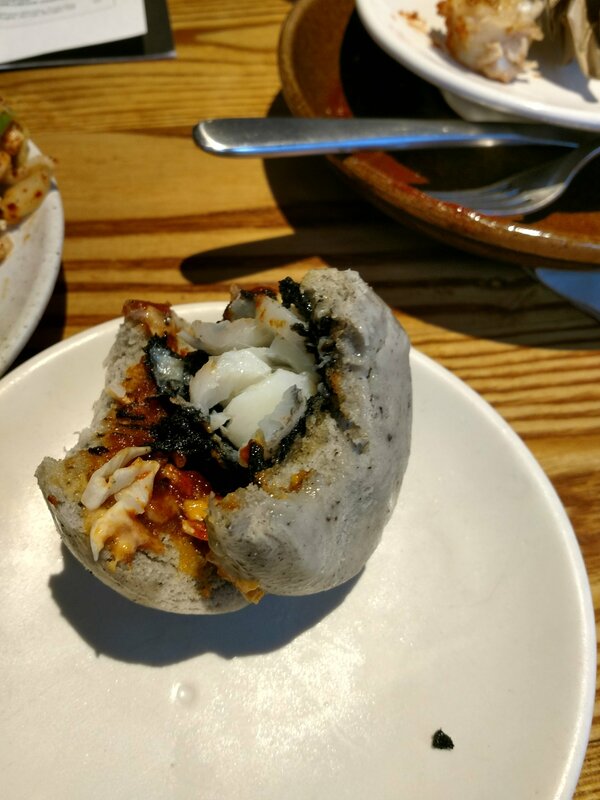 First up was a black cod bao (£5 – apt, as it was the dreaded Black Friday on the day of my visit), with pearly white, perfectly cooked, cod encased in a pitch black batter. 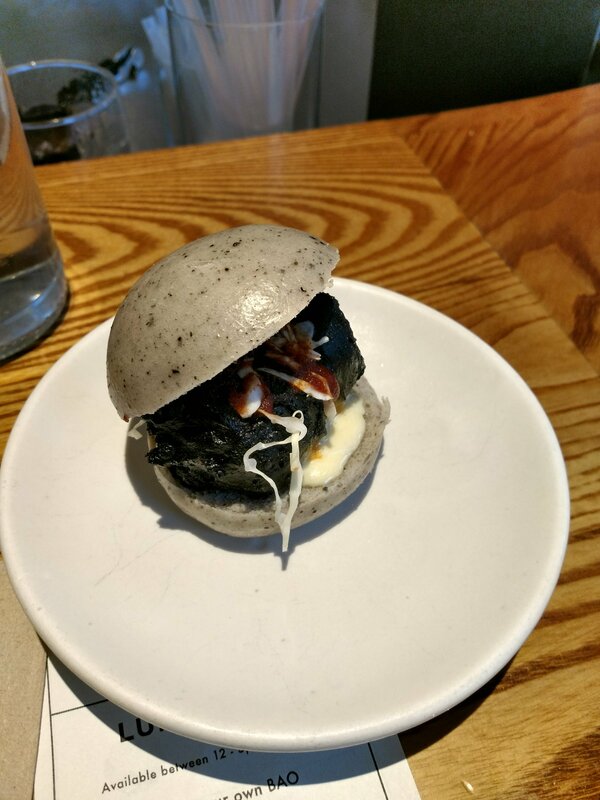 This came with a sharp, tangy, lemon mayo and splashes of hot and NG sauces all sitting in a sesame bao. Think a McDonald’s fillet-o-fish devised by the culinary Gods (rather than Satan, as was the case with the McD fillet-o-fish). 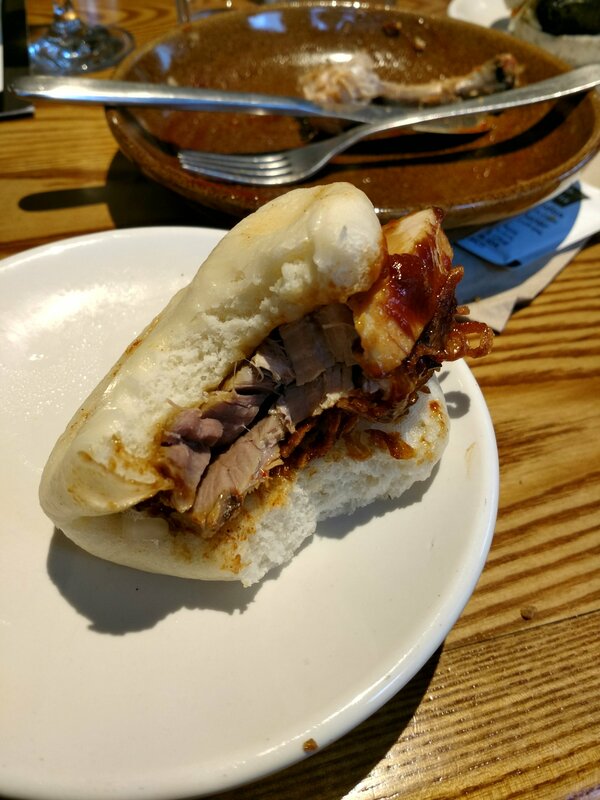 My second Bao, a confit pork number (£5), was a more traditional effort with a characteristic looking white bao. Stuffed to the gunnels with aged confit pork belly (beautiful flavoured, melt in the mouth, stuff) which was slathered in a rich meaty pork sauce (pepped up a notch by the addition of hot sauce) and topped off by sweet, crispy, shallot shards. An absolute triumph this – I could happily have eaten 10 of them!! Despite having pigged out a bit I had had my eye on the desserts on the menu from the start (holding fire initially as I didn’t want to over order), with both sounding rather fine. 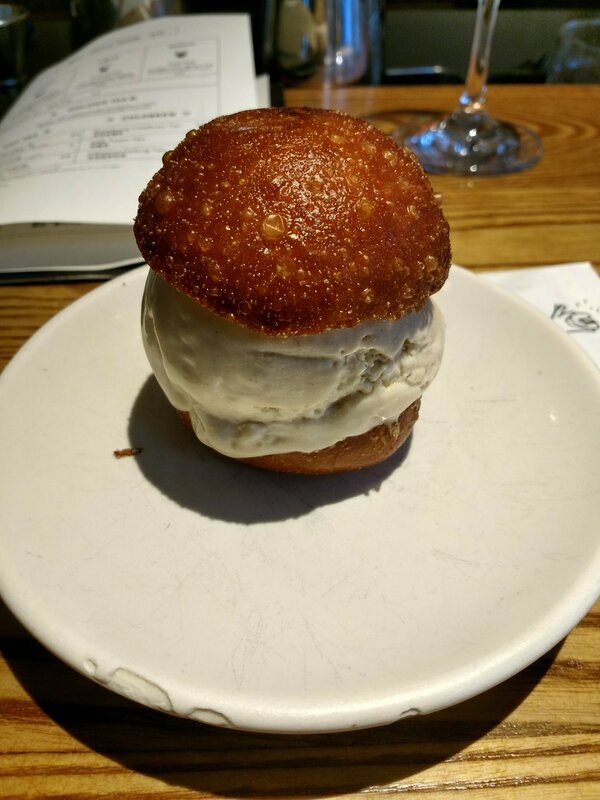 I am a big fan of peanuts in desserts (especially in brittle form), but was intrigued by the Horlicks ice cream bao (£4.50). Have to say I was not 100% convinced by the fried bao. Nice enough, but the frying process stripped it of it trademark fluffiness. 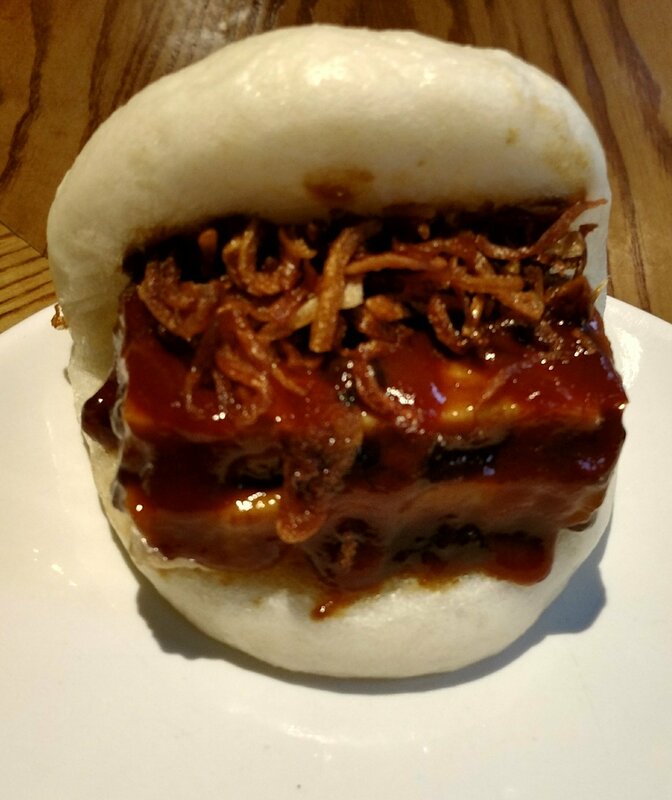 It became more doughnut in texture to me – nice but having lost something of it essential bao-ness. It was also impossible to eat as an ice cream sandwich (any attempt by me would, I have no doubt, have ended up with a large blob of ice cream being deposited in my lap). A spoon was wisely and gratefully deployed. 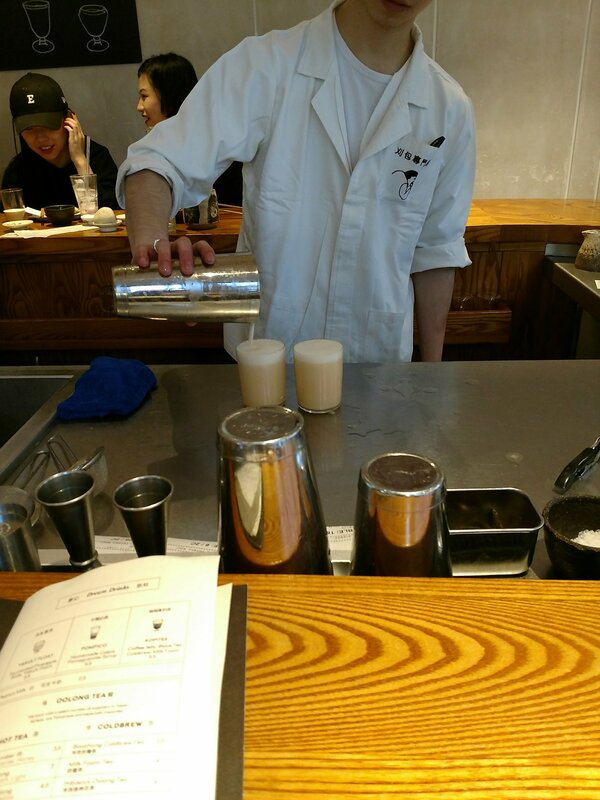 This place goes big on cocktails with a mixologist constantly at work in plan sight as you eat (always find watching stuff like this highly entertaining). 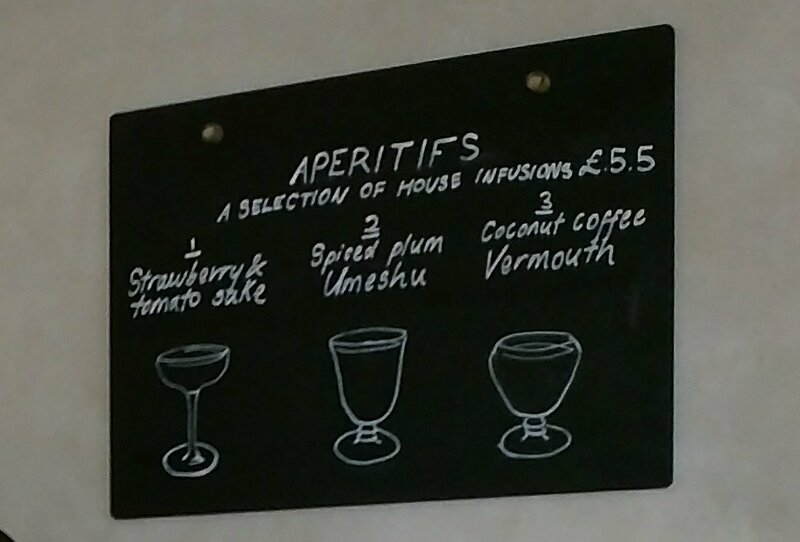 Both the appetifs and the cocktails here did, however, look and sound rather fine. 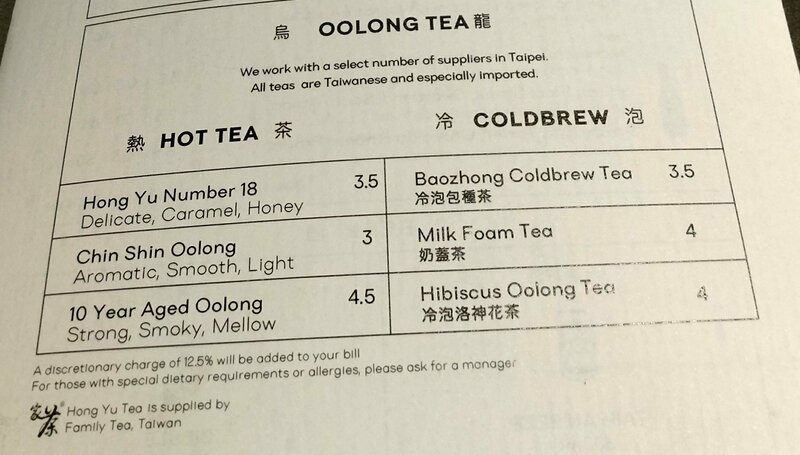 Soft and hot drinks, in particular the teas, are a cut about your standard offering by some considerable margin and thus if you are not drinking booze you are well catered for here. 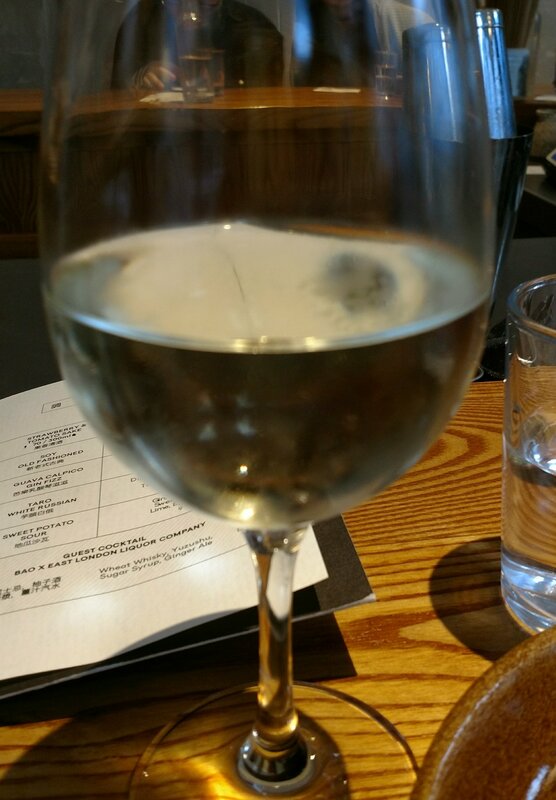 I had a half day so was on the booze and was delighted to see a Austrian riesling from the stable of Josef Ehmoser (a somewhat pricy £7.50 for a 125 ml glass – it retails for between £13 and £15 a bottle) on the short by nicely composed list. Lovely drop this, being dry (but not searingly so) with stone fruits (peach) and a touch of spice in there. Grest food wine (riesling always is) and a fine pairing for the Asian flavours of the food on offer here. 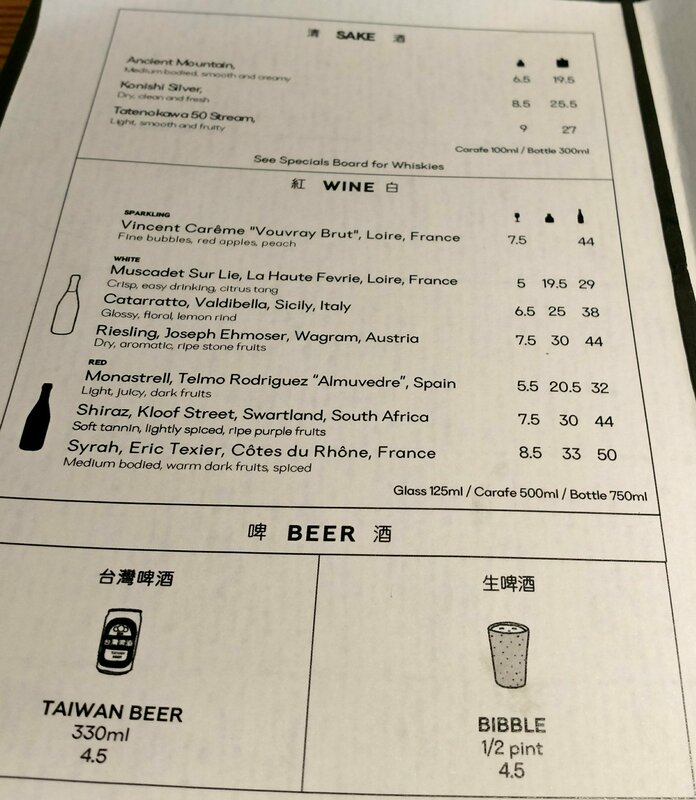 If I had being going more meaty in terms of my food choices, such as the Xinjiang lamb – if not too hot – and the meatier baos (such as a beef short rib), I might have been tempted by the Alicante Monastrell (I am a big fan of wine maker Telmo Rodriquez, as have not come across a wine he makes yet that I don’t like). Big, bold and spicy wine this, but not too heavy on the alcohol front (Monastrell can sometimes be a bit tannin heavy, which can jar with overtly spicy food, so care is required), I think it would have worked OK with the short rib bao and the lamb (as long as the latter is not too hot). With my Horlicks ice cream bao, I went for one of their teas. 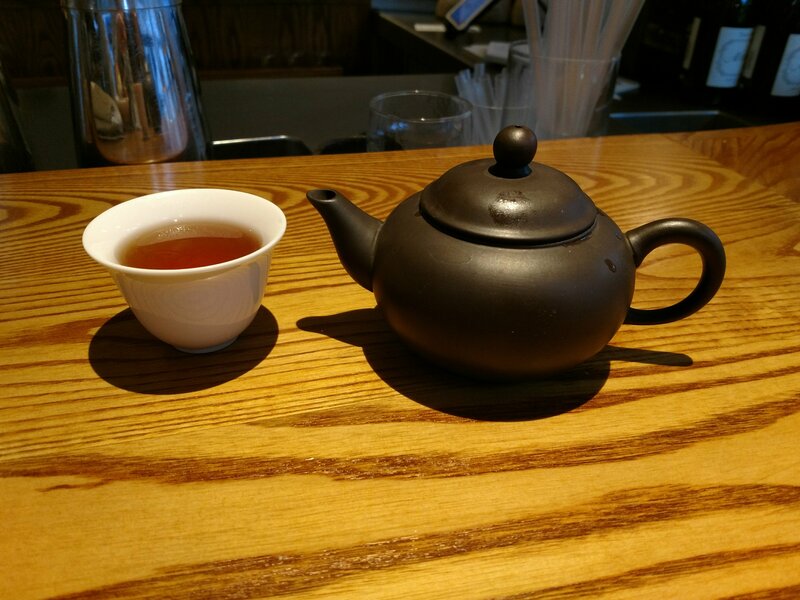 I went for the Hung Ho Number 18 (£3.50 for a pot), which came in a charming clay pot. 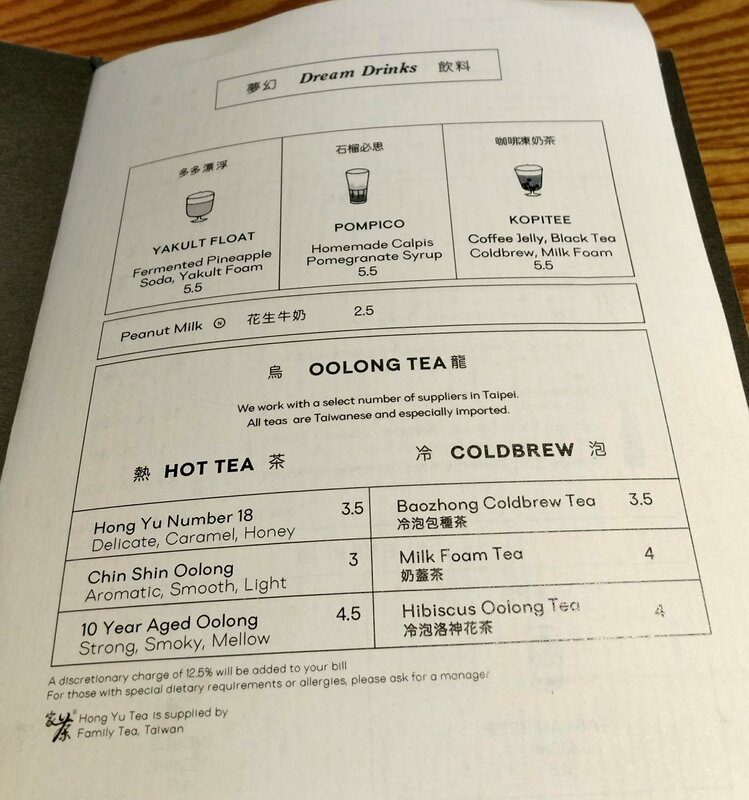 Advertised as having flavours of caramel and honey (so, in theory, great with the Horlicks ice cream bao), I detected flavours more of sweet, ripe, peach and apricot. Lovely on its own, it also worked a treat with the ice cream. My only quibble (you know there is always going to be at least one) was that there were no sherries (or Montilla Morales wine) on the wine list. The food here would have paired perfectly with sherry style wines. 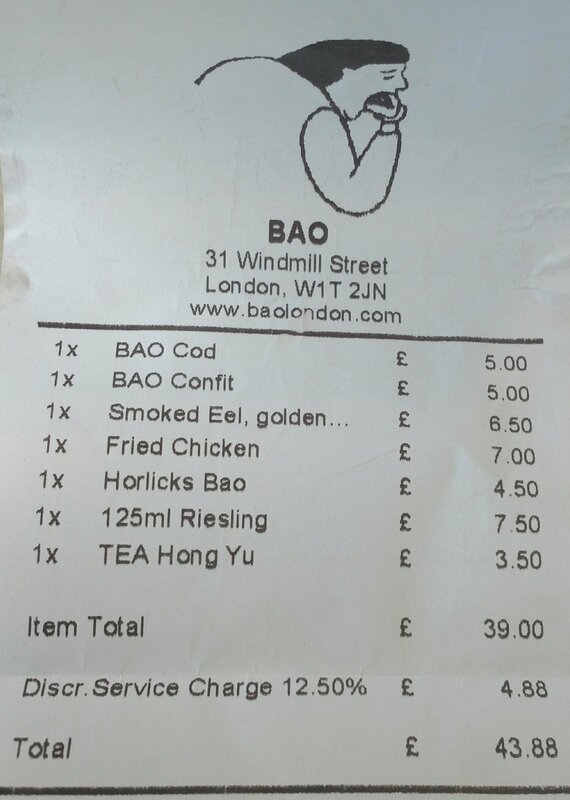 A fino en rama with the eel and kimchi and the cod bao, an amontillado with that killer fried chicken, a dry oloroso with the confit pork and a sweet oloroso or a cream with the Horlicks ice cream bao. Matches made in heaven if you asked me. 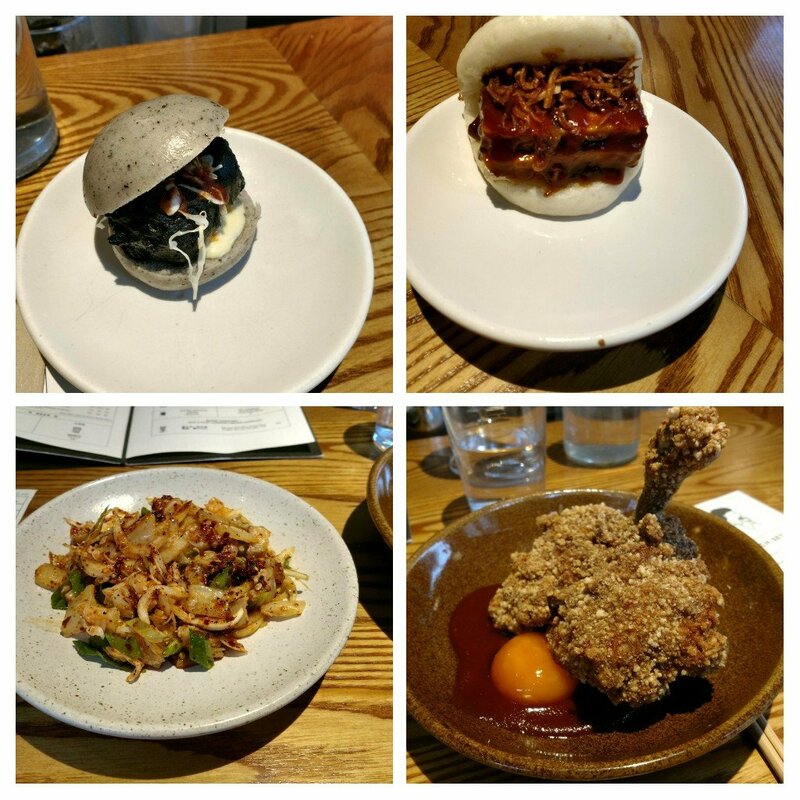 I went to Bao with very high expectations (with people whose opinion I trust on food loving it) and I was not disappointed. If anything it exceeded my very high expectations. Take a well deserved bao, Bao. Fabulous food, with the Taiwanese chicken chop dish (in particular) one that will live long in the memory. 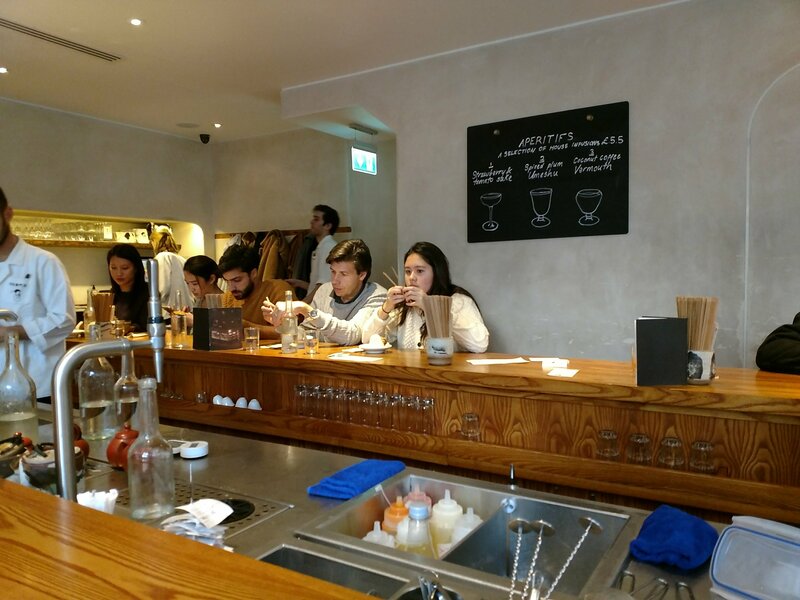 Drinks are also great (wine being a bit pricey aside and get some sherries or Montilla Morales wines in guys) and the staff lovely. Not usually a fan of the automatically added on to your bill of a “discretionary” service charge, but here I had no qualms. More than deserved. My bill did rack up a bit, but that was because I was a bit of a pig (nothing unusual there I hear you rightly say). I thought it fair value for the quality of what I had. Would I go back? Hell yes. Can’t recommend it highly enough. If you haven’t been (know I am, as ever, late to the party) think of an excuse, any excuse, to go!! 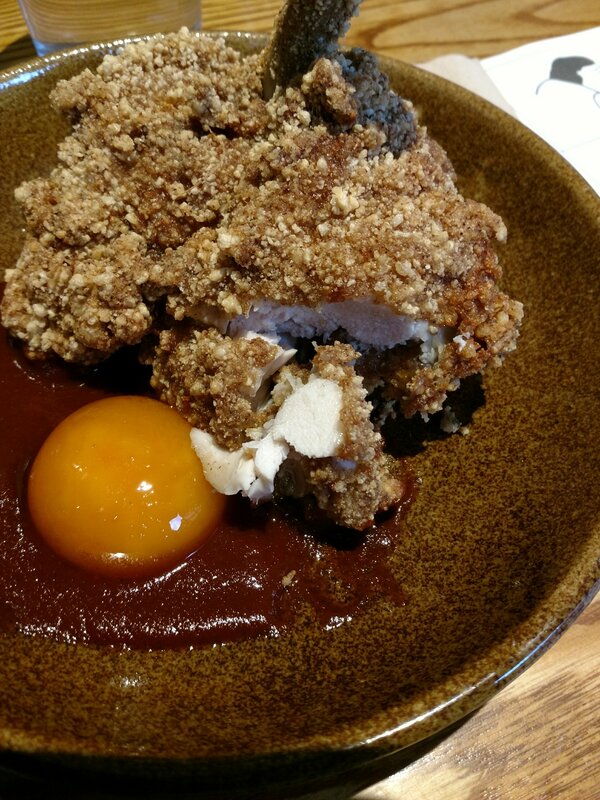 I, for one, need that Taiwanese chicken chop in my life again. Opening hours: Mon – Thurs: 12.00 – 15:00 and 17.30 – 22.00; Fri: 12.00 – 22.30; Sat: 12.00 – 22.00 and Sun: closed. This entry was posted on Dec 3, 2017 by solicitingflavours in Alcoholic drink, Alternatives to sauvignon blanc, Austrian Wine, Bao, Barbecue, beef, Beer, cocktails, Cote du Rhone, curing, Drink, Dry white wine, Eel, Fast food, fish, Fitzrovia, Food, Food and wine products, French wine, Ice cream, lamb, London, London restaurant, Lunch, lunchtime, Monastrell, Muscadet, Non alcoholic drink, Oloroso, Oolong, Pork, review, Riesling, Sandwich, Sherry, Spain, Spanish wine, Street food, Taiwanese food, Tea, Tea house, Uncategorized, vegetarian food, White wine, Wine, wine mark up, wine pairing, wine pairings.